The disciplined masked pro-wrestler from Mexico! As he appears in Tekken 5! This exceptionally detailed statue stands 19-inches tall and comes with a card of authenticity! 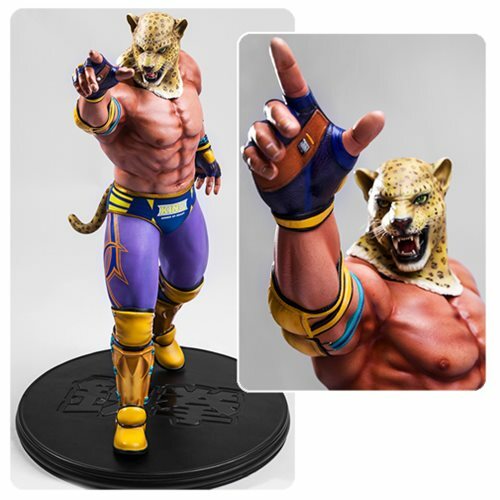 First 4 Figures is proud to present the powerful jaguar-masked fighter from Tekken 5! Cast in high quality polystone, King II stands beckoning his next challenger to take him on in combat. From his whiskers on his mask to the beads of sweat on his body, every detail has been captured perfectly and is complete with a detailed hand-painted finish for that realistic finish. King II stands an imposing 19-inches tall and comes packaged in deluxe full-color packaging with moulded foam interiors and a card of authenticity. King II is a disciplined masked pro-wrestler from Mexico. After becoming the successor to the original King (who was killed at the hands of Ogre), King II soon made a name for himself as being an incredibly capable fighter with his repertoire of wrestling moves and throws. Despite his intimidating appearance and great strength, King II continues and maintains his predecessor's fighting spirit by competing in the King of Iron Fist tournament to raise money for the orphanage he was once raised in as a child. Ages 14 and up.